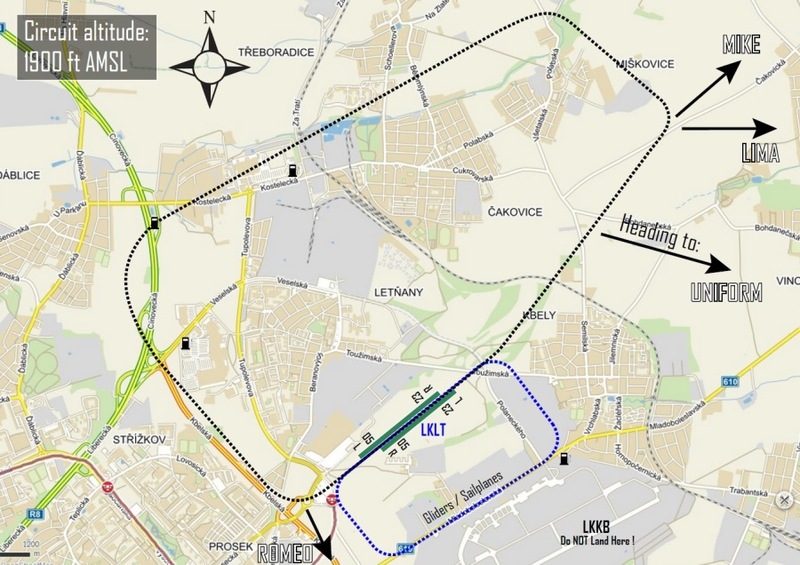 As Prague Letňany Airport lies in MCTR Kbely (LKKB), class C and D airspace category, arrivals and departures are possible only with two-way radio communication AFIS LKLT 120,335 MHz and MTWR Kbely 120,880 MHz. To enter the airspace MCTR Kbely (120,880 MHz) and LKLT it is necessary to follow entry points MIKE, LIMA, UNIFORM and ROMEO. Three minutes before reaching these points call MTWR Kbely (120,880 MHz) and follow their instructions. During the departure from LKLT please follow the instructions of AFIS service. Activation or termination of FPL can be provided by AFIS LKLT. Before and after the operational hours of Prague Letňany Airport the captains are responsible for departure and arrival, the captains must maintain contact on 120,880 MHz and follow the instructions of LSLPS Kbely. The operators are responsible for the air safety only during the stated operational hours (or else during the time demanded by the user of the airport, according to the VFR manual).